Life of a BZscrapper: Polka Dot Orchard-Coffee Pumpkin Flourish! I have a quick post today as I should be doing other things (as usual...lol!) but I was so lucky to get a chance to play with this new digi set from Polka Dot Orchard! It's called Coffee Pumpkin Flourish and it's available in the Polka Dot Orchard Etsy Shop here! The shop is owned by my bloggy friend, Jessica! She's got this one and another really cute set, Sketchy Pumpkin Spice available now with more to come! Both are available at the above link! Other products I used are: the adorable Lawn Fawn Knit Picky papers that I picked up at one of my local papercrafting stores, The Paper Collage and those pretty stitched leaves also from Lawn Fawn. The Square Scallop dies are from Craftin Desert Divas and the stitched background is from Stamplorations! Have to run! Thanks so much for stopping by! Gorgeous! LOVING that sentiment and the pumpkins!!!!! Fabulous card Lisa, awesome sentiment! Wishing you a Spooktaular Halloween! 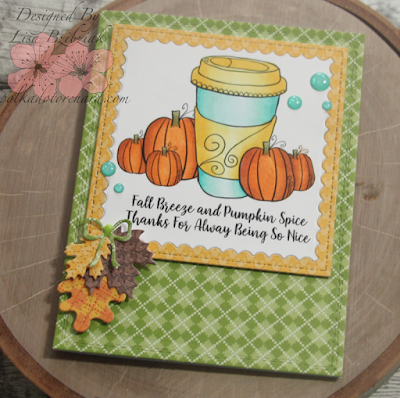 What a wonderful Fall coffee card. I love the whole design. LOVE the Digi image and your leaves... Such a pretty fall card! This came out so pretty. I love how you layered the pumpkins. Also, those colors you used look so yummy together.